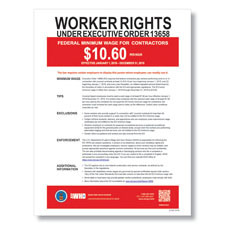 Effective January 1, 2019, federal contractors must display the new minimum wage poster. The hourly rate increased to $10.35 an hour. Under federal law, contractors must display a minimum wage posting prominently in the workplace. First, the service provides you with the required up-to-date poster. If there’s a federal minimum wage increases again requiring a new poster, you’ll get a free update automatically. 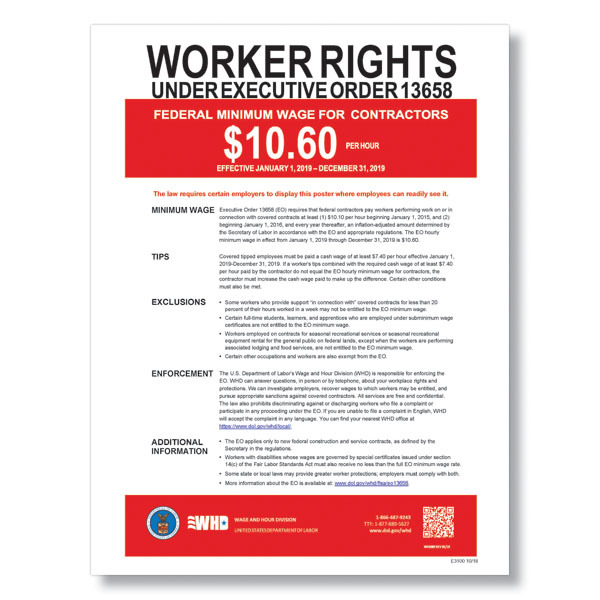 This mandatory federal minimum wage poster is required for contractors with FLSA-covered workers working under a covered Service Contract Act or Davis-Bacon Act contract. It also covers those with concessions contracts or contracts offering services to federal employees or the public on federal property. *Guarantee is valid for the term of your active, paid Poster Guard Compliance Protection and is limited to qualified government fines for improper posting content relating only to the postings included in the kit. Guarantee does not apply to additional postings that may be required for your specific business based on state/local law, contract, or other mandates, and does not cover any damages relating to contract suspension or any other financial loss.